SINGAPORE COMICS & COLLECTIBLES: GAMBIT #12 (2000) "Thief of Time!" 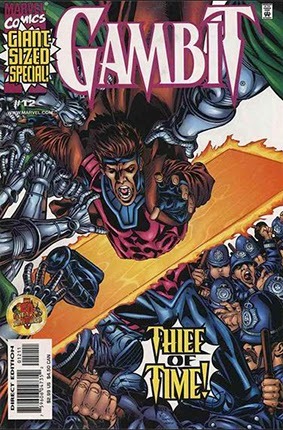 GAMBIT #12 (2000) "Thief of Time!" • PLOT SUMMARY: The Sunset Dawn Book 1 Chapter 1: "The Time Trap" - A double-sized journey into Gambit's never-before-known past! Nathaniel Essex... Candra... Jean-Luc LeBeau. These are the individuals who have shaped the life of Remy LeBeau. For more than a century, their destinies have intertwined. Here for the first time, learn how it all began! See: The manipulations of Sinister! Uncover: The bargain struck between the Guilds and the X-Ternal Candra! Plus: Gambit teams with... the greatest thief of the 19th century! By Fabian Nicieza/Steve Skroce/Rob Hunter.